Delight Mom with a handcrafted gift for Mother's Day. Here are three ideas to get you started. Curl one end of a floral stem or pipe cleaner to make the flower center. Attach the flower to the stem. Tip: First, poke a tiny starter hole in the tip of the flower with something like a skewer or bead reamer. 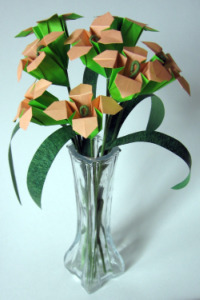 If the flowers tend to slide down the stem, put a tiny drop of glue at the base of the flower. Arrange the flowers in the vase, cutting the stems to the desired lengths. Cut leaves from the green paper. See Step 3 of the Easter Lily for one method of doing this. (Optional) Attach the leaves to leftover stem wire with floral tape. Add the leaves to your arrangement. This wreath is a lovely decoration for home or work. It's identical on both sides so it looks great in a window or hanging as a mobile. When made from standard 6-inch paper, it's 7¼ inches across. A smaller size would make a nifty coaster set. If you've yet to make a modular ring like this, we suggest you get one of Tomoko Fuse's books and try it. You will like it! 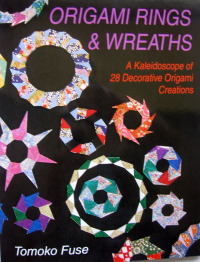 This wreath is "Ring 1" in her book Origami Rings & Wreaths. It requires eight modules, one piece of paper for each. The folding process is very easy. The Myabi paper has a semi-glossy surface that makes assembling the units a breeze, as well as making a beautifully colored wreath. Hearts represent love at anytime of the year. This unique Pull-Apart Heart Card has been very popular with our readers. 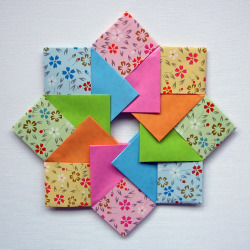 It's based on one by Charlene Olexiewicz in her book 50 Nifty Super More Origami Crafts. 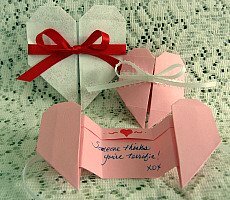 Find more ideas for Mom's Day by browsing through our collection of Valentine projects.